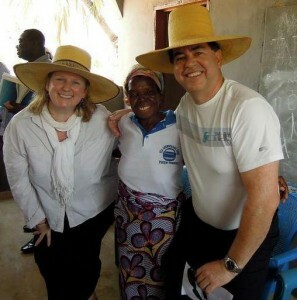 Debra Kerby and Derek Briffett with one of the women basket weavers at the Vea craft centre. Vea, Ghana, Apr 10, 2013–If you could bottle energy and passion and hope from the women of Vea in the Upper East Region of Ghana, I am 100% sure that we could truly change the world. What an exciting and informative day – and I learned some new dance moves! We have travelled north to Bolgatanga municipality in the Upper East Region, to visit our partner TradeAID Integrated (TAI), an organization founded to take an economic empowerment approach to poverty alleviation in this very poor region in the northeast part of Ghana, bordering on Burkina Faso to the north and Togo to the east. Executive Director Nicholas Apokerah provides an overview of TAI’s work. 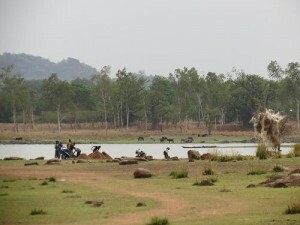 The NGO has been expanding over the last 10 years in the areas of rice, tomatoes and shea butter production for high-need communities, and they have also expanded into Bolga basket weaving by the local women (and a few men, too) for alternative forms of income beyond traditional farming. 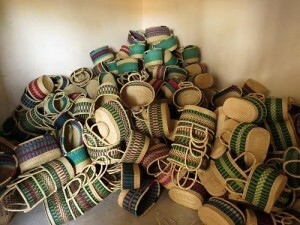 Bolga baskets destined for international markets. The Bolga baskets have been developed with specific designs in mind for Western markets, and TAI has found fair trade buyers in North America and Europe for the baskets, bringing profits back into the program and to the women who had previously relied solely on agriculture. Once again we take the time for a courtesy visit with the Regional Minister for Upper East Region – the Honorable Alhaji Limuna Mohammed Munira – who is also the Minister of State for Government Scholarship. While this man may be new in this role and new to Upper East, he has been very well-briefed by his Chief of Staff, also in attendance, on the work of TAI and the CIDA CHANGE project: the focus of our meeting. 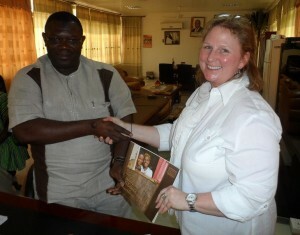 Regional Minister, the Honorable Alhaji Limuna Mohammed Muniru. After presenting the work of TAI and CFTC and our new Theory of Change focus, he states that we are definitely on the right track in terms of food security and education as priorities for the Upper East Region. In his new role, he has spent time just in the last few weeks visiting with communities and District Assemblies and learning the realities of this region. We took the opportunity to see the ‘Vea dam’: a large body of water (the size of a small lake) that is used as a reservoir to irrigate nearby crops and for domestic purposes. 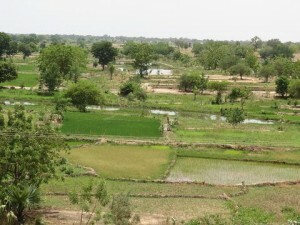 We saw the difference that living close to such a water supply can make to farmers trying to grow crops. Sounds self-evident, however it is striking to see the difference in the green and lush plots of land close to the dam’s canals and compare those to the dry and sparse lands of communities we have visited that are further away and not yet linked into the system due to lack of infrastructure funding or due to local government delays. Although just a few kilometres, it makes a huge difference to a community that must manage that extra distance to access the water they need for crops and living. The land in the Upper East Region is quite rocky: lots of granite outcrops, which remind me a little of Northern Ontario on a much smaller scale. It makes growing crops harder and access to water of greater importance. The difficulties of growing crops was one reason that many of the women of Vea, in the past, had to leave the village to travel south in search of work – often taking their children with them and facing many dangers on the road. Men own the land in Ghana so they stayed put to do the farming – however the basket weaving has changed all of that, as the women themselves told us. The basket weaving – which they do for a few hours at the end of a workday spent farming and doing domestic chores – has allowed them to stay in Vea and earn new income which benefits the whole family. This came up when I asked them about the cheer the women kept shouting out to each other during our meeting with them – a cheer which essentially means “always sitting down!!!”. This seemed a strange thing to cheer at first – especially for Canadians who are told we are sitting down too much (!) 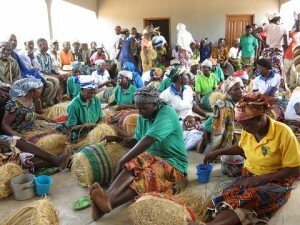 – however one of the women leaders explained that TAI’s support for them to train and organize on weaving the baskets meant they no longer had to travel to earn money to be able to feed their families. With the building of the Vea Craft Centre just a few years ago (which CFTC helped TAI to fund and the community helped to build), the women now have a safe place and space to earn a living for their families by sitting on the floor and weaving beautiful baskets – and as such they aspire to be “always sitting down” to create a better life for their families. 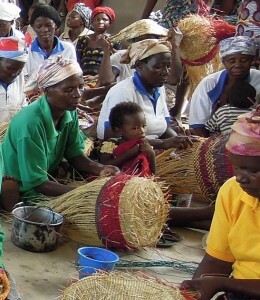 Women with children at the Vea craft centre. While they are sitting, they are also taking literacy and numeracy classes and this is also changing their lives. They made modest requests for lighting in the centre so they can study and weave at night, and for a daycare centre where the children can be cared for while they weave so they can focus more on their work. The unsolicited support of the men was also inspiring. They spoke about the extent to which the women are no longer coming to them to ask for money (in fact, the men now come to the women for money! ), said that there is good and varied food in the homes now, and that the women are much happier and productive than before – and this makes them much happier. Some of them are starting to get involved in basket weaving too, which speaks volumes to the connectedness of men and women in the community and to the benefit of supporting this alternative form of economic empowerment in a traditional farming community. We all leave inspired and in awe of what a difference something as simple as weaving a basket can make to change the lives of an entire community, and full of great ideas to discuss with our partner TAI about how we can extend and grow this model – and this incredible Vea ENERGY – to other communities in Ghana.